However, does the past value really have any forecasting power on the future? In order to build a good model for sales forecasting, we must learn more about the relationship between the sales at the different time point. The DS data set contains the price of a stock over a period of 300 days. Now, we'd like to look at the relationship between the stock price at two consecutive time point. We will create another column called PREV which contains the stock price on the previous day. For example, the stock price at time 2 is $100.22. The previous day's price (i.e. time 1) is $99.7. We want to look at how the prices on two consecutive days are correlated with each other. 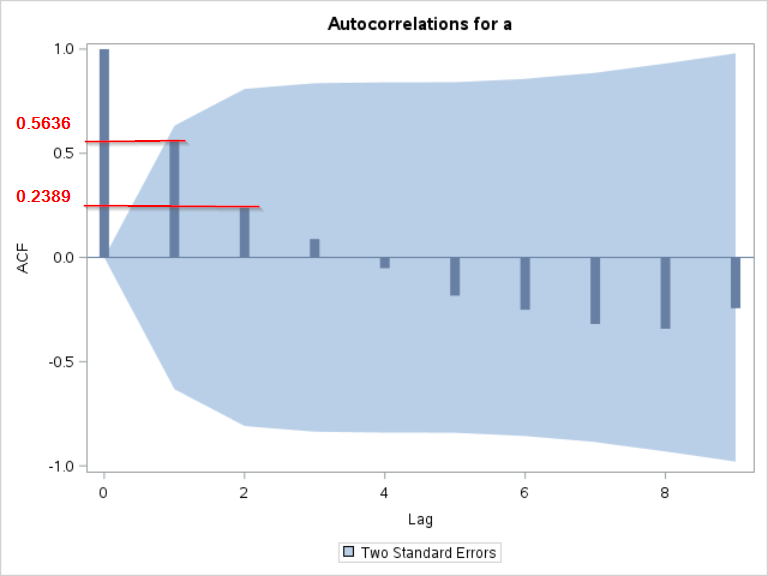 We will treat these two columns as two separate columns and compute the autocorrelation between them. 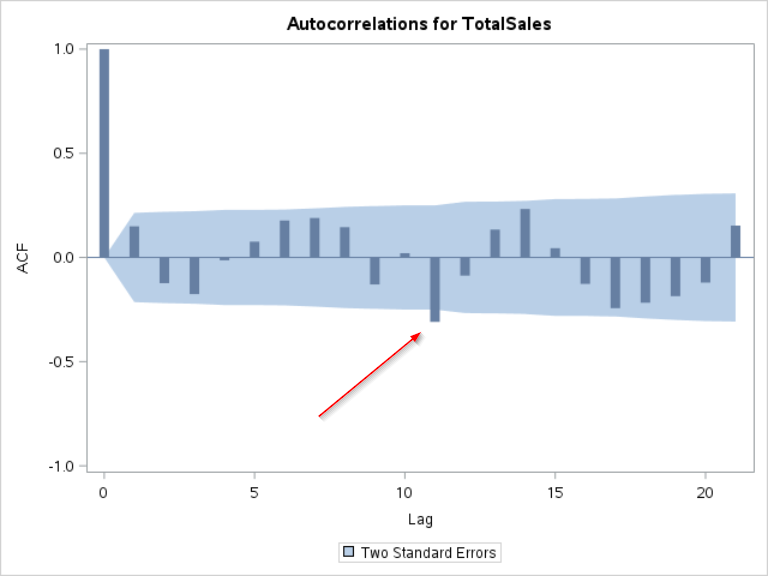 ​SAS does not have a built-in option to calculate the autocorrelation. IN: the input data set. In our example, it is the DS data set. VAR: the variable of interest. In our example, it is the variable STOCKPRICE. 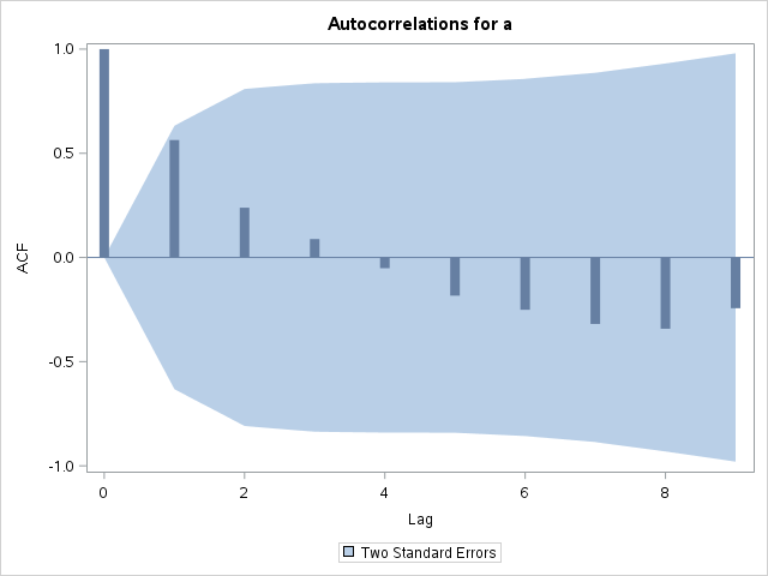 LAG: the number of lag you want to compute for the autocorrelation. The macro computes the autocorrelation between the current day's stock price and the previous day's stock price. That's a very high correlation between the stock prices on two consecutive days! When performing the forecasting, this is a hint that the stock price on the previous day is highly correlated with the current stock price that you want to forecast. Now, what about the correlation between the stock price and the price from two days prior? Maybe the price from two days ago are also correlated with the current day's price? We will use the AUTOCORR macro to compute the autocorrelation between the current stock price and the price from two days prior. The autocorrelation between the current stock price and the price from two days prior is 0.9612. This is still a very strong correlation, although it is less strong than the autocorrelation at lag 1. The correlation isn't as strong as with the one-lagged value (i.e. r=0.5636). Maybe we should put more weight on the closer time period than the future time period when performing the forecasting. This is the idea how you build the forecasting model. We have just computed the autocorrelation at lag 1 (r=0.5636) and lag 2 (r=0.2389). However, are these values statistically significant? Maybe these positive autocorrelation estimations are generated by chance? Fortunately, we can perform statistical testings to find out whether these values are significant. The ACF plot shows the autocorrelation of each lag on the plot. You can create such a plot using the TIMESERIES procedure. If you look at the bar at lag 1 and lag 2, the results match our calculations earlier. The ACF plot also shows the confidence interval. 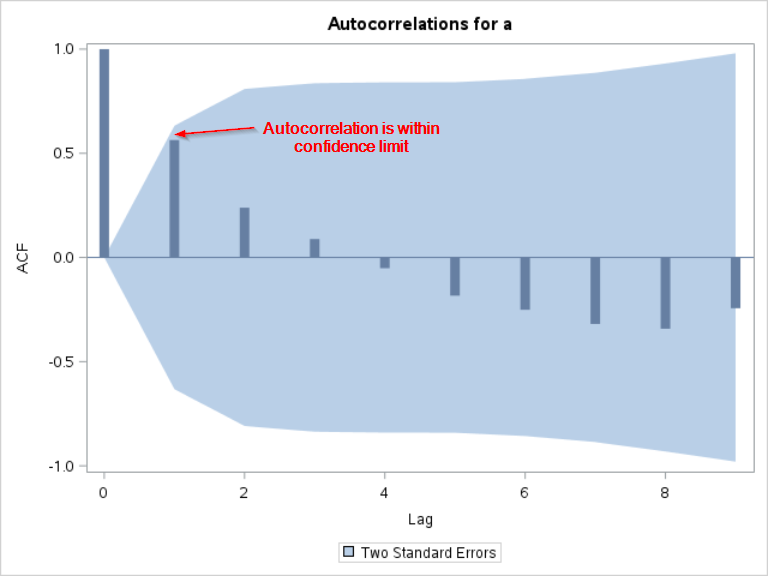 Although the autocorrelation at lag 1 is fairly high (r=0.5636), we cannot conclude that the autocorrelation is significant since it is still within the confidence interval. There is no significant autocorrelation on the ACF plot. 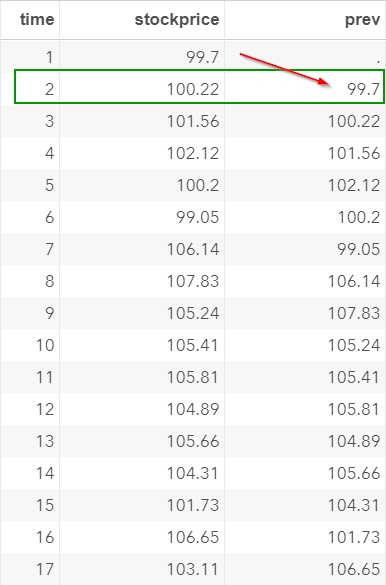 The current value does not seem to be significantly correlated with any of its lagged values. 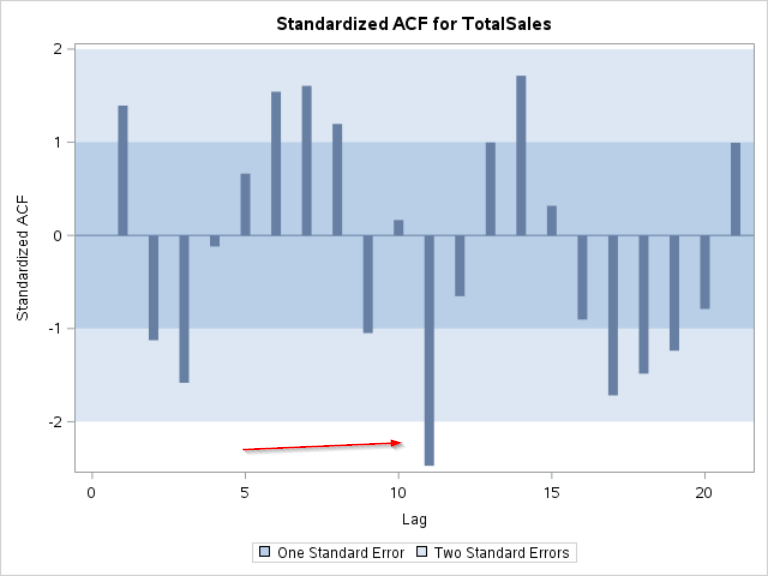 Let's go back to the SALES3 data set and plot the ACF plot for the TOTALSALES column. The plot shows a spike that is significant at lag 11. This indicates that the sales today is significantly correlated with the sales from 11 days ago. This information will be useful when we build our final model. In the next section, we will look at a few more examples of the ACF plots.